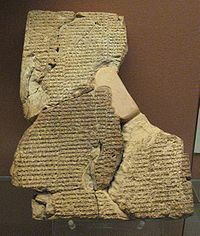 Panbabylonism (also known as Panbabylonianism) is the school of thought that considered the cultures and religions of the Middle East and civilization in general to be ultimately derived from Babylonian myths which in turn they viewed as being based on Babylonian astronomy, often in hidden ways. 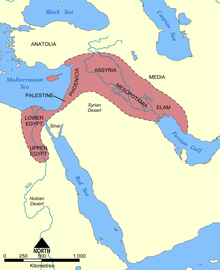 A related school of thought is the Bible-Babel school, which regarded the Hebrew Bible and Judaism to be directly derived from Mesopotamian (Babylonian) mythology; both are forms of hyperdiffusionism in archaeology. Both theories were popular in Germany, and the height of Panbabylonism was from the late 19th century to World War I. Prominent advocates included Friedrich Delitzsch, Peter Jensen, Alfred Jeremias and Hugo Winckler. Panbabylonist thought largely disappeared from legitimate scholarship after the death of one of its greatest proponents, Hugo Winckler. The claims of the school were largely discredited by astronomical and chronological arguments of Franz Xaver Kugler (a Jesuit priest). ^ Toy, Crawford H. (1910). "Panbabylonianism". Harvard Theological Review. 3 (1): 47–84. JSTOR 3142227. ^ a b Brown, Peter Lancaster (2000). Megaliths, Myths, and Men: An Introduction to Astro-Archaeology (Dover ed.). Mineola, NY: Dover Publications. p. 267. ISBN 9780486411453. Anonymous. (1912). Some Recent Books on Panbabylonism. Studies: An Irish Quarterly Review 1 (3): 563-578. G. H. Richardson. (1916). The Abuse of Biblical Archaeology. The Biblical World 47 (2): 94-99. Bill T. Arnold and David B. Weisberg. (2002). "A Centennial Review of Friedrich Delitzsch's "Babel und Bibel" Lectures." Journal of Biblical Literature 121/3: 441-57. Panbabylonism. New Catholic Encyclopedia, 2003. The Development, Heyday, and Demise of Panbabylonism by Gary D. Thompson.